If you are beginner level in Laravel, and if you want to learn How to use Ajax with Laravel, then you have come on right place because in this post you can find How to Live data search with Sort table column data in ascending or descending order and Pagination in Laravel framework by using Ajax. We have always try to publish something new post which will help you to learn something new. So, here we have publish new article on Laravel with Ajax and make simple mysql table data live searching, table column sorting data in Ascending or descending order with pagination link. This is amazing tutorial of Laravel tutorial series with Ajax and here we have make search filter with sortable table and pagination link. Which is one part of any crud application. So, by using this tutorial you can make simple application in which can live search mysql data, sort tabular data and pagination link in Laravel framework using Ajax. 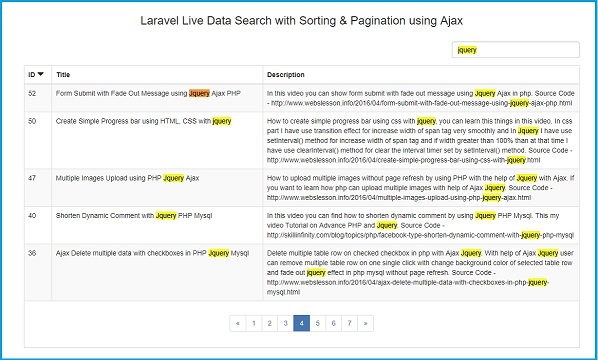 In short we will do column sorting with Live data search in Laravel using Ajax. We all know by using Data sorting and searching is important for find quick and perfect data in a very short time. Here we will take a live example of data sorting in ascending or descending order with pagination. Here we will not only implement tabular data sorting but also we will also make pagination link with column sorting in Laravel using Ajax. We will discuss step by step this ascending or descending column sorting of data with pagination using Ajax and Laravel. This tutorial will show you how to create data sorting with pagination operation without refresh of web page with Laravel jQuery and Ajax. Here we have start from scratch. So, If you have not install Laravel application, then you have to open command prompt, and run composert command, and then after you can run below command this command will download Laravel application, and install at define destination. Once Laravel application has been installed successfully, then first you have to make database connection. For make database connection you have to .env file and define following database configuration. After making database connection, we have to make one PaginationController file under app/Http/Controllers/PaginationController.php. This controller will handle http request for display data on web page with data sorting and pagination request. For display data on web page, in Laravel we have to create view file in resources/views folder. In this folder we have to create two view files like pagination.blade.php and pagination_data.blade.php. In pagination.blade.php you can find complete html jQuery and ajax code for data sorting and pagination. In this file we have include pagination_data.blade.php file data by using @include statement. Below you can find source code of both view files. Lastly we have to set route for controller and method which we have make under controller. For this we have to go to routes/web.php file and write following code for set route. Once you have completely follow this step then you can make data sorting and pagination in Laravel with Ajax. For run laravel application, you have to run following command. After run this command, then you will receive message like Laravel server has been start with this link - http://localhost:8000/. For run this application you have to type following link in your browser.